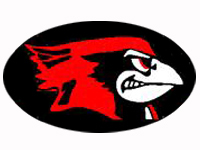 The Ell-Saline Cardinal girls’ basketball squad suffered a heartbreaking loss Thursday evening in the consolation semifinal round of the 2019 Hilltop Hoops Classic in Great Bend, falling in overtime 54-51 to the Ness City Eagles. The Cardinals began the ballgame on fire, going 9-for-12 from the field in the first quarter, helping to propel Ell-Saline (0-12) to a 21-15 lead after the first eight minutes of action. After falling behind by eight points early in the second quarter, Ness City (2-9) tightened the screws defensively, fighting back to trail by just one at the half, 28-27. The second half was a thrilling nip-and-tuck affair, with neither team leading by more than five points the rest of the way. The Cardinals outscored the Eagles 13-11 in the third quarter to hold a 41-38 edge going into the fourth quarter. With 1:30 left in the fourth, Ell-Saline held a five-point edge, but Ness City battled back to tie the game late, then had two shots at the end of regulation to win, but missed both to force overtime. Neither team connected from the field during the overtime period, but the Eagles went 4-for-8 from the charity stripe in the extra session, while Ell-Saline went just 1-for-2, giving Ness City the three-point win. The game was won at the free throw line by the Eagles, as Ness City outscored Ell-Saline by 16 points at the stripe, going 19-for-35 on the contest, while Ell-Saline went just 3-for-7. Ell-Saline was paced by sophomore Reece Ditto, who scored a game-high 14 points for the Cardinals. Sophomore Brynna Rowley connected on three 3-point buckets on the night, finishing with 13 points. Junior Erin Lange and freshman Raleigh Kramer each chipped in seven points in the Cardinal loss. Ness City received a tremendous effort from senior Tiana Epperson, who led all scorers on the night with 21 points – all coming in the game’s first three quarters. Freshman Taylor Starr scored 11 points, including seven in the fourth quarter and overtime, while junior Summer Pfannenstiel added nine.